This weekend found the boss-lady and I down in Pensacola, FL again. This time we traveled south to say goodbye to a good friend. Remember Shirley? We traveled down here to join her and her family in saying goodbye to their father, a long time friend of the boss-lady and I. In fact, he was instrumental in the joining of the boss-lady and I. A thing that I have thanked him for, and cursed him for, over the years. Let me tell you a little bit about this man who, while seemingly rough and ill-spoken on the outside, had a heart as big as Texas. I first met him when we served together aboard a mighty warship, the name of which doesn’t matter. He kept trying to introduce me to a relative here, or a relative there, and I always rejecting his offers. He did however manage to introduce me to his wife’s cousin (the boss-lady). Our lives have never been the same. Now, just shy of our 30th year together; we are saying goodbye to the man who paired me with my better half. And for that I’ll be forever grateful. Even in his downward spiral he wanted to help others, and people have been coming out of the woodwork to let his family know just how highly regarded he was in his little corner of society. And that gift, call it grace if you want to, is something to be remembered. There is a mourning ring that seems oddly appropriate for him. I ran across the image in an article entitled “Love after Death: The Beautiful, Macabre World of Mourning Jewelry” on the website io9. 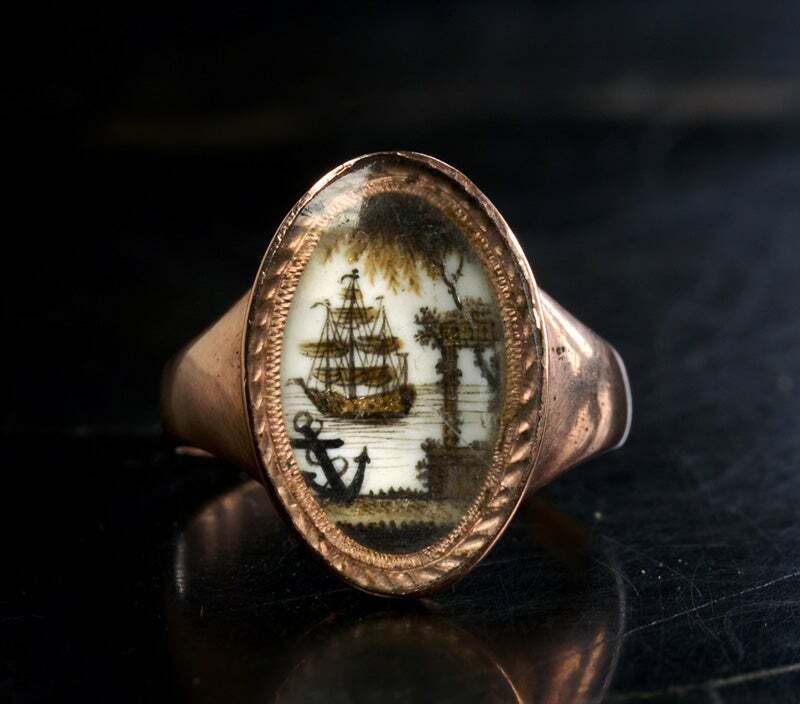 the article goes on to explain the ring was created sometime in the late 1700s, what makes this ring special is the ship, which collectors say is uncommon among these types of items, which usually feature urns or willows. The ship’s presence on a ring like this represents the journey into the afterlife, while the beached anchor symbolizes hope for those the loved one left behind. And if you look closer you can see that the golden details on the ship were created out of tiny bits of hair. The deceased’s hair was chopped up and used to paint with, and oftentimes incorporated into the piece of jewelry itself. It was also appropriate that at the church we attended Sunday morning, there was a baptism of a young infant boy. The point wasn’t lost on me. The circle of life continues, one life ends and another begins. Such is life, maybe, just maybe a piece of my friends soul will end up in this boy. Goodbye my friend – Fair Winds and Following Seas.